Join three of the 55 Colorado Sheriffs who have filed a lawsuit over Democrats’ radical anti-gun legislation for an event on Tuesday, May 28 at the Freedom Financial Expo Center in Colorado Springs. The event will support the lawsuit and will feature Independence Institute’s Dave Kopel, an expert on Second Amendment issues. Tickets: $5, may be purchased here. Kopel serves as the research director for the Independence Institute, as well as an associate policy analyst at the Cato Institute and adjunct professor of Advanced Constitutional Law and the University of Denver’s Sturm College of Law. He was a critical voice in testifying at the Capitol about Colorado’s pending gun legislation. 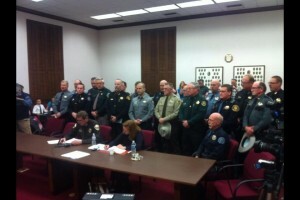 Several Colorado organizations and companies have also joined in the lawsuit, including Outdoor Buddies, a non-profit dedicated to assisting disabled individuals; licensed firearms dealers, Magpul, the National Shooting Sports Foundation, the Colorado State Shooting Association, the Colorado Farm Bureau, the Colorado Outfitters Association, and Women for Concealed Carry. Read about the civil rights complaint here.